Real Food Wythenshawe‘s Pineapple Cooperative is delighted to announce it has bagged £4,000 from a Tesco funding scheme. Tesco teamed up with Groundwork to launch its ‘Bags of Help’ funding initiative, which sees grants – raised from the 5p bag levy – being awarded to thousands of local community projects every year. Millions of shoppers voted in stores up and down the country. And it can now be revealed Wythenshawe’s Community Housing Group’s Real Food Team has been awarded £4,000 .Work will now begin on bringing the project to life. The Pineapple Cooperative will work to bring the walled garden in Wythenshawe Park back to its former glory, working alongside local groups and stakeholders. 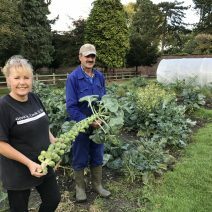 The Project is led by Real Food Wythenshawe who will support groups and offer advice and resources to help restore the historic walled garden back into food production. Group Chief Executive Nigel Wilson said, “This is fantastic news for the Real Food Team, who do such an amazing job in Wythenshawe and beyond. I would like to thank everyone who voted for the project and invite you to come to Wythenshawe Park and see the difference that the team are making”. Voting ran in stores throughout May and June with customers choosing which local project they would like to get the top award using a token given to them at the check-out. Since launching in 2015, Bags of Help has awarded more than £33 million across more than 6,300 local projects. Groundwork’s National Chief Executive, Graham Duxbury, said, “Bags of Help continues to fund thousands of projects across the UK. We want to ensure that the money raised benefits as many local people in as many different places as possible so we’ve extended the range of groups and projects that we can support.